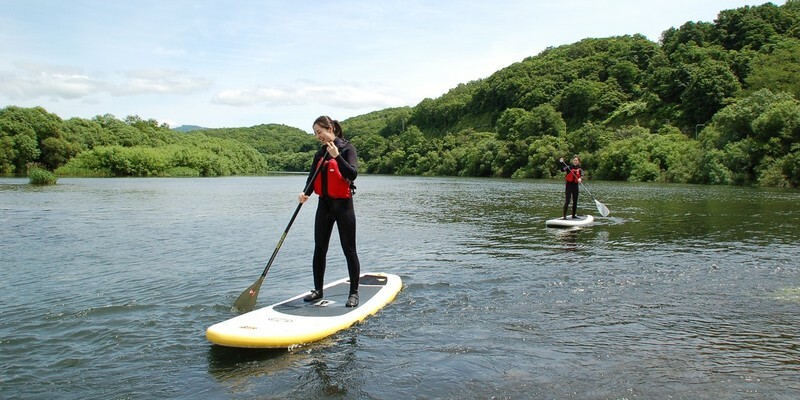 Standup paddleboarding (SUP) is a watersport that has recently exploded in popularity. Why? It’s very intuitive and easy to learn, provides a new perspective for exploring the water, and most importantly, it’s a lot of fun. One of the most popular areas in Niseko to SUP is in Lake Toya. Clam water, beautiful scenery, and mild water temperature make Lake Toya a perfect destination spring through fall. In the spring, the rivers can be running very fast, and this makes it difficult for beginners to navitage on a SUP. However, mid-summer through autumn the Shiribetsu river provides perfect conditions. Standup paddleboards for beginners are inflatable. This means losing your balance and falling in the water is reletively harmless. SUP is relaxing and the perfect warm weather activity for families. Some people even take their dogs on their boards with them! Vacation Niseko has great relationships with the premier Standup Paddleboarding companies in the Niseko area. Contact our Niseko Specialists to inquire or book the best SUP tour for you!